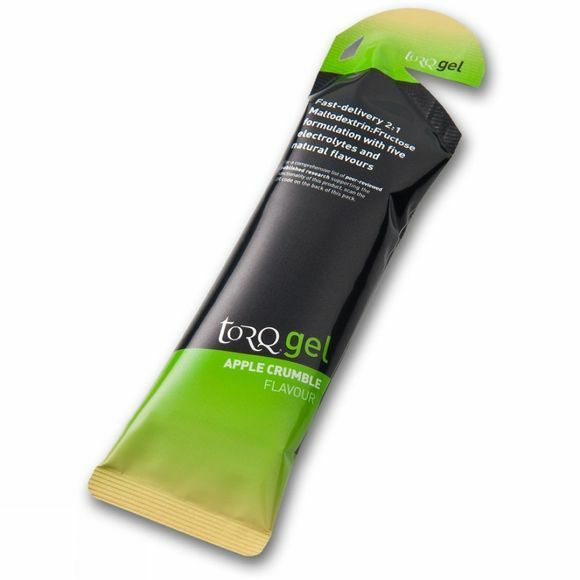 Torq Energy Gel Apple Crumble uses a 2:1 blend of maltodextrin and fructose to fulfil the energy needs of performance athletes and physically active people. It tops up your energy reserves and replaces the five electrolytes lost in sweat. Maltodextrin provides an instant hit, then fructose prolongs this energy peak. You can use Torq Gels as part of the Torq fuelling system. Each gel packet contains 1 Torq unit. Research shows that individuals can take up to 3 Torq units per hour during exercise, but newcomers and smaller individuals are recommended to take 2 Units per hour and gradually experiment with higher doses. If you are perspiring heavily, more Torq units should be obtained via a Torq Energy Drink, whereas Torq Gels and Bars are advised for cooler conditions. Maltodextrin (43%), water, fructose (21%), electrolytes (sodium chloride, potassium chloride, calcium lactate, magnesium carbonate), citric acid, natural flavour (0.1%), preservative (potassium sorbate).